No matter if you are in your pew listening to a sermon, choosing a book at the Christian bookstore, or reading some essays online, you need discernment to determine if what you are absorbing aligns with God’s word or is a lie designed to incrementally steer you away from the narrow path. 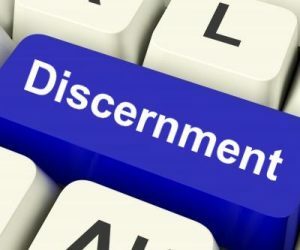 There’s online discernment ministry, and there’s online “discernment ministry.” I hope I’m the former. The latter is often discussed negatively. When “scare quotes” are put around the name of discernment ministry, it’s a pejorative. Scare quotes in journalism are sometimes called sneer quotes, so you get the idea. Though I post articles about a trio of topics, including encouragement and prophecy, I do post articles about discernment. I post articles naming names of false teachers. One-third of what I do online regarding my blog is online discernment. So, am I one of the good ones, or one of the bad ones doing “discernment ministry”? Let’s have a two-part lesson on how to do online discernment ministry, and through it I’ll reveal what I do and how I go about it, and I’ll challenge you to test the discerners you follow, (including me), by sharing how. What Is Discernment and is it Biblical? One of the gifts given to people by the Spirit is discernment. (1 Corinthians 12:10). This is one of the spiritual gifts given to me. I primarily serve in my local church, which I believe is extremely important because it’s a command (Ephesians 4:12, Romans 15:2 etc). Spiritual gifts are meant to be used in a local body of believers, for edification and for accountability purposes. Biblically, discernment is important. It’s a skill all believers must hone, but some were given ‘an extra dose’ if you will, in the form of a specific gift. In the days when the canon was not set, prophecies and revelations and epistles were coming in to the believers. Some of the letters were false. Each local body needed to be able to determine which messages were truly from a designated apostle, and which were false. The church at Ephesus was praised for having developed worthy discernment, (Revelation 2:2) while the church at Thyatira was rebuked for their lack of it. (Revelation 2:20). The gift is still in force today, much needed, as many false prophets have gone out into the world, and we must test the spirits now as then (1 John 4:1). By 2003, user-friendly blog platforms had come along, and Blogger announced it had a million users. Christians rapidly gravitated to this new publishing method and pastors and theologians were setting up blogs to push the message. So were lay theologians, cranks, wingnuts, and anyone with a theory or opinion, including me. My first blog came along in 2006 but after two and a half years of writing increasingly Christian content, I separated the content and started a second blog, this one, in January 2009. It is solely focused on Christian content while my other one remains personal. I’ve blogged just about every day on The End Time blog ever since.